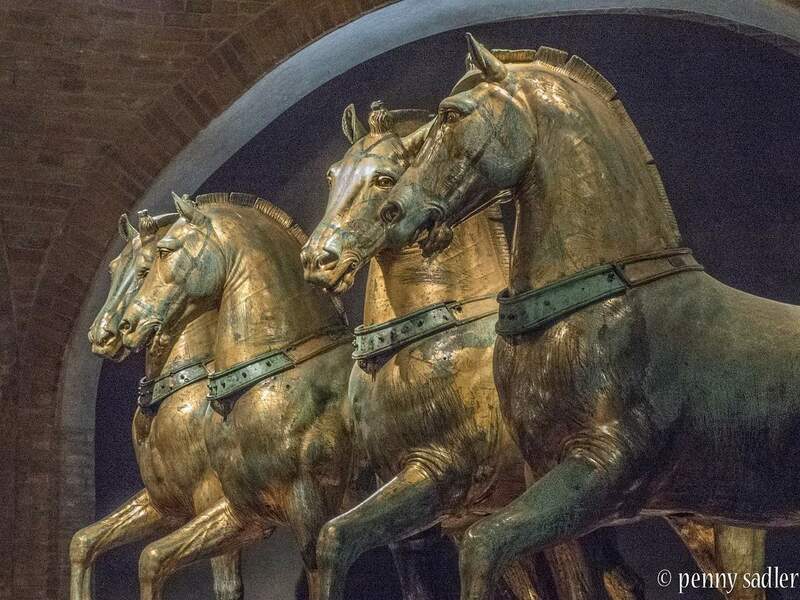 When a travel blogger friend of mine recently told me she was going to Venice, I mentioned my desire to see the Horses of St Mark’s Basilica. These four near Life-size horses are said by many to be among Europe’s finest creations. Although I was delighted to receive Penny’s photographs of the horses today I have to admit to being a tad jealous! They really are exquisite artefacts, made all the more fascinating by their biography, a biography that has been shaped by some of Europe’s significant historical events. Of their origins, there is much conjecture and discussion. One thing we can be certain of, however, is their composition. Although the horses are often described as bronzes in fact the metal they were made with is 96.67% copper. This is not a minor insignificant detail. Copper melts at a higher temperature than bronze, making it much more difficult to work with. Unlike bronze, copper can be gilded. And it is the use of this metal and technique in sculpture making that suggests a Roman date for the horses rather than a Hellenistic one. So the physical make-up of the horse sculptures rules out what scholars thought for a long time, that they were made in the 4th century BC by the Greek sculptor Lysippos. A date some time in the 2nd or 3rd century AD is now generally accepted. 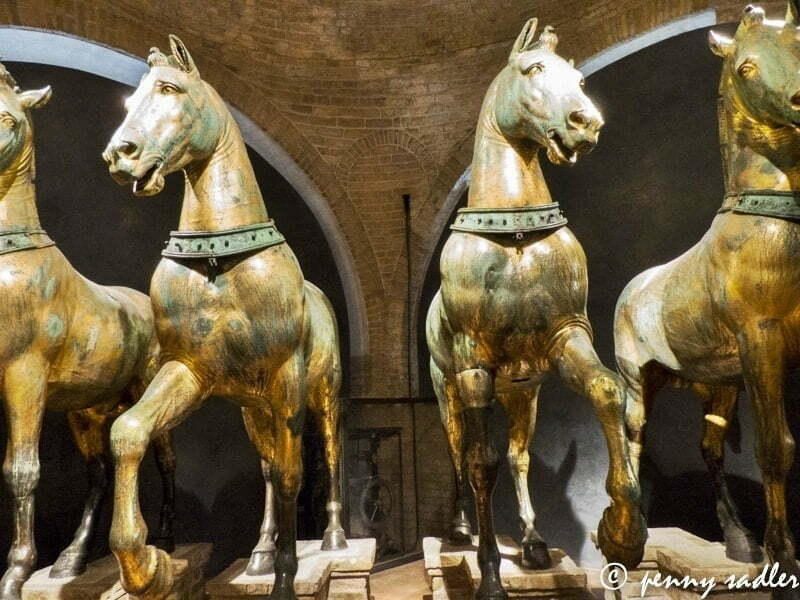 Martin Henig, a widely respected author on Roman Art, compares these horses to the horse on which Marcus Aurelius rides in the so-called Equestrian Statue of Marcus Aurelius. A copy of this well known statue stands in the Piazza del Campidoglio, while the original is in the Capitoline Museum, Rome. That statue is also large, over 4 metres high, and was erected in Rome in 175 AD. 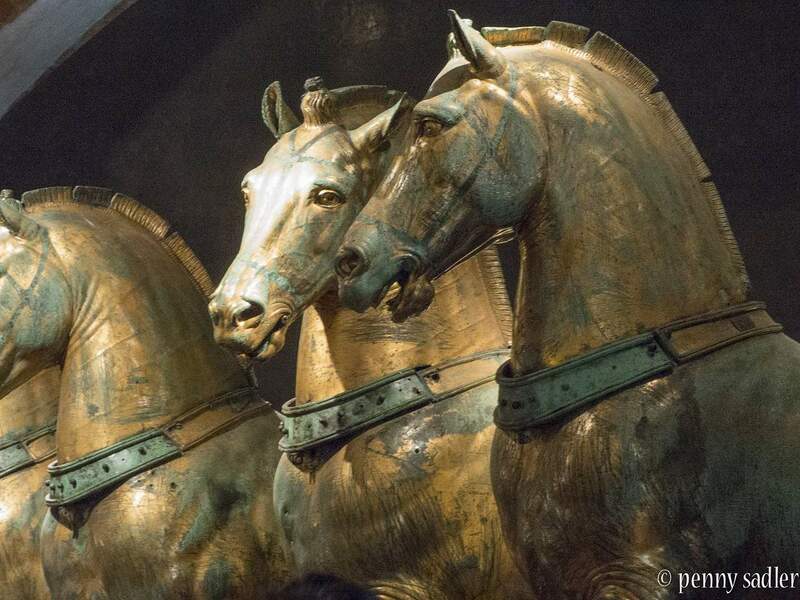 Today, these horses can be seen inside Saint Mark’s Basilica in Venice. When they came to Venice in 1254 they were placed on the front façade of the basilica, in pairs above the central portal. Given concern for their continued preservation because of increasing levels of air pollution, the horses were taken down and placed inside the church in the 1980s and replaced with replicas. St Mark’s Basilica, Venice, with the replica horse statues. Now, in the Hippodrome there was a tower which stood opposite the spectators; beneath it were the starting posts, which opened into the racecourse through parallel arches and above were fixed four gilt-bronze horses, their necks somewhat curved as if they eyed each other as they raced round the last lap. Where ever in Constantinople the horses came from, it was following the sack of Constantinople during the Fourth Crusade in 1204 that they were sent to Venice by Enrico Dandolo – the leader of the Venetian Crusaders. They were again looted by Napoleon when in 1797 he conquered much of Italy. The horses, along with a vast war booty, were paraded before Parisians, in much the same way that Roman Emperors commemorated their victories. 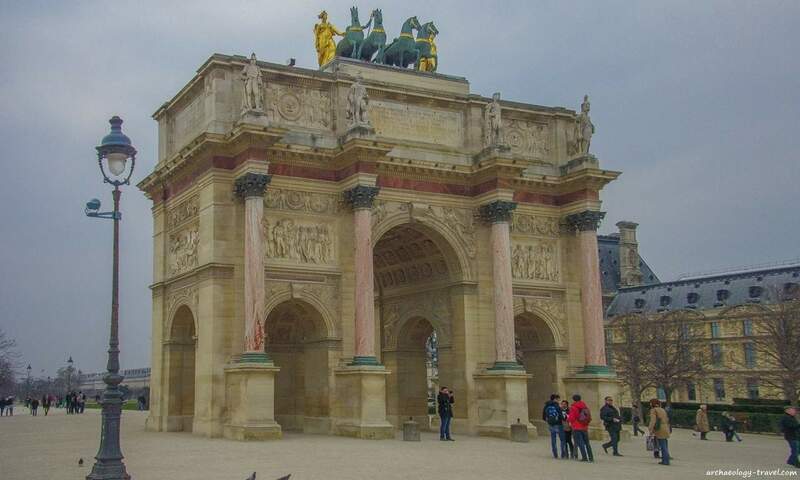 To provide a permanent commemoration of his victories, Napoleon had the Arc de Triomphe du Carrousel built, which was modelled on the Arch of Constantine in Rome. The horses, with a chariot to form a victory quadriga, were placed on top of the Parisian arch. The horses’ stay in Paris was short-lived. Following Napoleon’s defeat at Waterloo and the restoration of the Bourbon Monarchy in 1814 the statuary were returned to the Austrian Empire who, in the terms of the Congress of Vienna, had annexed Venice. The Austrians in turn returned the horses to Venice. Like many artefacts in museums around the World, the St Mark’s Horses are not simply exquisite objects from a distant past to be admired. They have played an active, symbolic role in Europe’s changing political landscape. And, as is so often the case, it is these biographies that make artefacts like these all the more interesting. Penny Sadler is the author of Adventures of Carry-On, a travel blog with lots of beautiful photographs and inspiring articles about art, architecture, culture and people. Penny also provided a wonderful set of photographs for a post I wrote on the Archaeology Behind the Trevi Fountain in Rome. Taking guided tours is not for everyone, but there are benefits. A walking tour with a guide often allows you to skip the queues – why waste your precious time waiting in lines. The queues to see the ‘Bronze Horses’ are infamous – skipping the queues is a must, in my opinion. To see the horses, there are a number of options available to you. 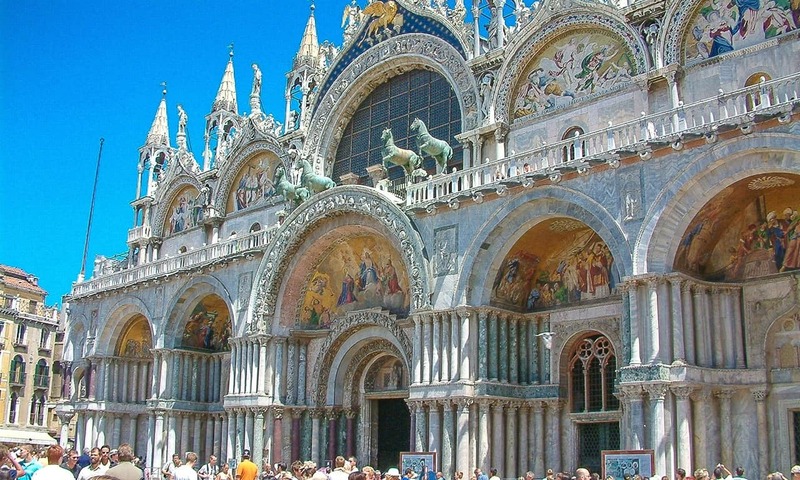 To begin with there is a one hour walking tour of the highlights of St Mark’s Cathedral and its treasures, or a two hour tour of St Mark’s Square including the Basilica, the Doge’s Palace and the Bridge of Sighs. For not that much more you can get your own private guide for an Art and Architecture Walking Tour of Venice. There really are many other tours on offer, as well as a variety of activities and things to do in Venice. For example, for the photographers a 2 hour photography walking tour or a half-day food, wine and culture tour, and even Venice for Kids – a private education tour specifically designed for children. PreviousThe Colossal Statue of Tutankhamun? Nice article and I’m happy to report that it follows exactly with what the guide told us today on the tour of St.Mark’s. She did however, believe they are made of bronze, not copper, but it could have been a translation issue. :) I am glad you approve! Despite being made of copper they are still referred to as ‘bronzes’, we do not say ‘coppers’ when talking of statuary made of copper. In one sense, ‘bronzes’ is a generic term for statues that are made of copper and tin (component metals of bronze proper). Thanks again for the wonderful photos. Still need to go and see them for myself! They are beautiful and I love that your photos capture the lighting so well. Thanks for the lesson in the metals, I had no idea. The photos are great, aren’t they Maria. That is good news Mia :) Thank you for leaving a message – it is always a joy to get feedback from my readers. I hope you get a good mark! Thank you Sharon. I suffer the same issue … my bucket list just gets longer by the day. Thanks for your info including the bio book recommended. I shall buy it soon.We just completed our own adventure tour of Prague, Budapest, Vienna, Verona, Amalfi, Sorrento, Rome, Venice. These 4 horses we discovered by accident after buying the 5 euro ticket to go up to the terrace and museum. They were one of the highlights of past 6 weeks. We are seniors, flashpackers, and will definitely follow your writings. Thank you :) But what a wonderful chance find that must have been for you both. Glad you got to see them! Look forward t reading more of your comments and updates! Wow! I have viewed many photos of these same horses, and Penny Sadler certainly has created the most beautiful images. She must know and love horses. Thanks for sharing her photos with us. They are stunning photographs. I am not sure whether Penny has a love of horses or not. I do recommend her travel-blog – many more wonderful photographs. Thank you for the interesting information. Although I have seen them twice, I did not realize all that they had been through. After finishing Dan Brown’s “Inferno”, I decided I needed to know more, and your information has been very enlightening! Thank you Robin, I am glad you found the article interesting. Thanks so much for the compliment to both of you!